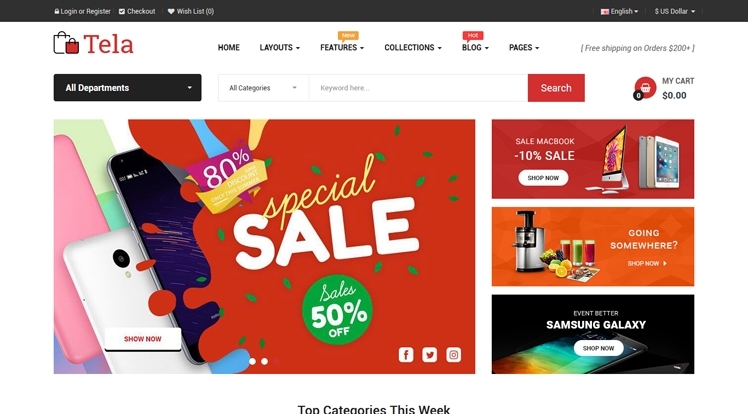 Be in the best theme in series of the Responsive OpenCart 3 Theme Collection, So Tela is outstanding with gorgeous which designed for any online market store, mega store, fashion/clothes store and etc. On the trending of OpenCart 3 theme, Tela is only $39 definitely will satisfy you. With beautiful design, powerful features & functions; of course; your business goals will be achieved over than expected. When you surf the site, homepage slider with many smooth effects very attractive, besides, it also supports multi-language ( not translate), multi-currency, image popup view and much more. Tela OpenCart 3 Theme is worth to try!! !